Shopping in Granada is made easy because the main shopping district is located within the historic center. 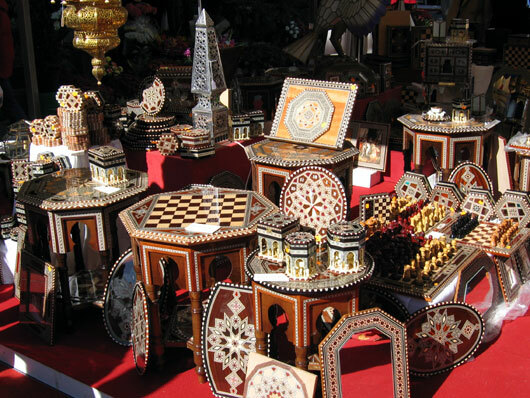 Granada also may be one of the best cities in Spain to purchase items from Morocco and other parts of Africa. May of the typical tourist items – tea sets, tapestries, leather goods, clothing, rugs – are generally cheaper in Granada than they are in the nearby cities of Seville, Malaga and Cordoba. Still, you have to find the right places – some stores are particularly expensive, with tourist prices! If you are searching for these types of items of course Morocco is where you will find the best prices. Granada is not just about tourist gifts, and you will find plenty of other stores in the main shopping district. Stores generally close for siesta time, but are open from 10:00 – 14:00 in the mornings and then again in the afternoon from 17:00 – 20:00. Some may keep their doors open until 21:00. El Corte Inglés, the giant Spanish department store with just about everything you could imagine, is open all day from 10am-10pm. A few stores may be open all day as well, generally they a few chain supermarkets, smaller neighborhood grocers, tourist shops and some clothing stores. Opencor, owned by El Corte Inglés, is open 365 days a year although it closes around 2am. While most shops always have something on sale, there are two official sales periods: January after the holidays and then July-August. These periods were carefully selected to 1) get rid of overstock after the holidays or before the fall season and 2) boost retail sales in times which are generally weak. It is hard to miss the sales if you are in town, as everyone will have a sign indicating “Rebajas”. This is a very popular time to shop, and the first few days always have a few special offers which get people up early in the morning. For clothing and accessories the best street may be Calle Mesones, where there are a number of recognizable stores and brands. Reyes Catolicos and Via de Colon also have a number of stores. While under Muslim rule, the Calle Zacatín was the location of a textile market, and still is known for clothing and fabrics. As with any shopping district, it is always interesting to wander from street to street to see what there is to offer. For more window shopping, try the Calles San Antón, Recogidas , Alhóndiga and Puentezuelas. Mixed in with the retailers are smaller family owned stores (electric supplies, an occasional cobbler) as well as a few cafes and bars where you can rest your legs and enjoy a beer or coffee. Those visiting the Capilla Real and the Catedral will have a hard time missing the Alcaicería, a former Nasrid silk market. While a fire destroyed the original market in the middle of the 19th century, it was rebuilt and is now the home of many smaller shops selling plenty of tourist items. Ceramics, t-shirts, and silver goods are a few examples. There is also a section of items from typical of the origins of the market – textiles, leather bags, tea sets, lamps, hookas and more. The market is a series of narrow pedestrian streets between the Cathedral and Reyes Catolicos, reaching the Plaza Bib Rambla. The Calle Calderería Nueva is a narrow street starting close to the Plaza Nueva, holding tourist shops, numerous tea houses, a few restaurants and other small merchants typical of the times of the Arab quarter. This is one of the most charming shopping streets in the city and there are some similarities to the typical streets one might find in a medina in Morroco. While it's not close to the scope of the medinas in Morocco and other countries, you can find a wide variety of goods, ceramics, rugs, clothing, lamps, furniture, spices, teas, a bakery or two, and more. This is also the most popular starting point to make your way to the upper section of the Albaicin neighborhood. El Corte Inglés is the place to go if you need several items, or if you are having a hard time locating a specific item. This is because the department store has just about everything: clothes, furniture, grocery store (with many hard to find food items), travel agents, tobacco shop, jewelry, electronics, cameras, computers, tourist items, leather, hardware, perfume, toiletries, barber, cafe, optician...the list goes on and on. The most central location is in the historic center on Carrera Genil, a very easy walk from the major monuments, etc. Owned by El Corte Ingles, this is open 18 hours a day (generally closing at 2am), 365 days a year and offers a small selection of items from El Corte Ingles: supermarket, bakery, magazines, videos games, gifts and other items. The prices are of course higher, as you pay for the conveneice of a store which is open almost all of the time. It can also be a lifesaver when you can’t find anything else close by. The location in Granada closest to the center is on Paseo de la Bomba, not too far from the main tourist attractions and neighborhoods.